Optimal management of synchronous colorectal liver metastases demands a wellorganized inter-disciplinary strategy by surgeon, oncologist and radiologist. Over the past decade, advances in management strategies of patient with liver-limited metastases have incredibly improved the overall prognosis. This review discusses the advances made in the management of patients with colorectal cancer liver metastases. A literature search was performed, using the following databases: PubMed, SCOPUS sciencedirect, EMBASE, and NHS Knowledge Network. The retrieved articles were assessed for relevance for inclusion in this review. The review illustrates that although currently surgery offers the best chance of cure in patients with colorectal liver metastases, the majority of patients are not initially resectable due to the size, anatomic location, extent of disease, inadequate remnant liver volume, or comorbidities. This necessitates other treatment modalities to control or downsize the hepatic lesions before embarking on the surgical intervention. Systemic and regional chemotherapy complements the surgical cure in the majority of patients. Background: Osteopontin (OPN) is expressed in various malignancies and may play an important role in tumorigenesis, tumour invasion, and metastasis in various malignancies including thyroid cancers. The objective of this study was to investigate the relationship between OPN immunoexpression and clinicopathological characteristics in thyroid lesions. Material and methods: Paraffin blocks belonging to 160 patients with thyroid neoplasms were retrieved from the archive of the Department of Pathology at King Abdulaziz University, and King Faisal Specialist Hospital, Jeddah, Saudi Arabia. Immunohistochemistry was performed using anti-OPN antibody. Statistical tests were used to determine the relation of OPN immunoexpression to clinicopathological characteristics and survival. Results: Immunostaining results showed that OPN was localised in the cytoplasm and nucleus with higher cytoplasmic expression. Cytoplasmic and nuclear OPN was higher in thyroid cancer than other lesions. 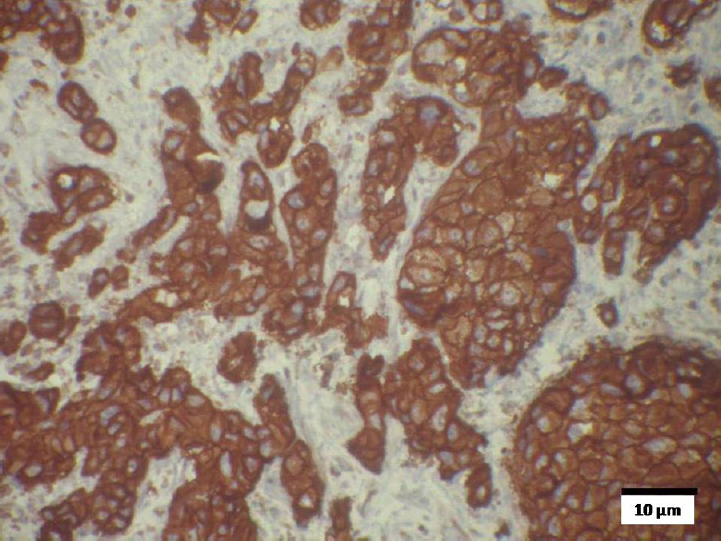 Microcarcinoma variant of papillary thyroid carcinoma showed a lower OPN cytoplasmic level than other variants. OPN cytoplasmic expression was not associated with most of the clinicopathological parameters tests. However, OPN cytoplasmic overexpression was associated poor survival outcome (p < 0.001). Conclusion: Upregulation of cytoplasmic OPN was associated with poor survival outcome and was an independent predictor of margin involvement and recurrence. Nuclear OPN expression was lower than cytoplasmic and was associated with extrathyroid extension of thyroid cancer. OPN plays a role in thyroid carcinoma and incoming research has to be focused on the mechanistic association with invasion and metastasis. This study assessed the human epidermal growth factor receptor-2 (HER2) protein expression in urothelial bladder carcinoma and its relationship with p53 and p63 expression. 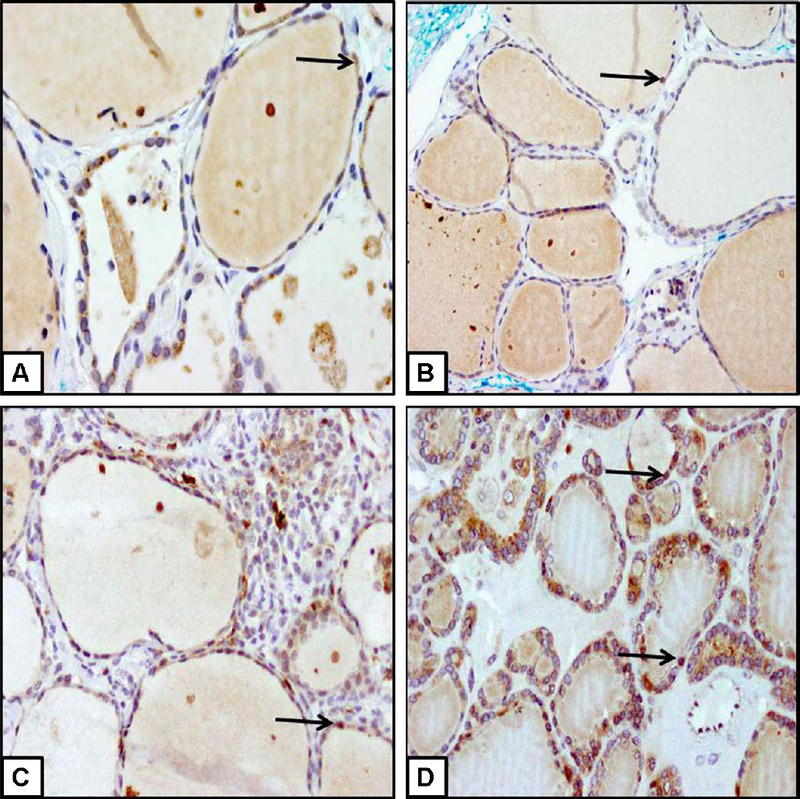 In 151 patients, paraffin-embedded tissues of transurethral resection or cystectomy were evaluated by immunohistochemistry (IHC), using antibodies against HER2, p53 and p63. HER2 overexpression (score 3+), p53 overexpression and decreased expression of p63 were detected in 14 (9.3%), 48 (31.8%) and 58 (38.4%) tumors, respectively. HER2 overexpression, p53 overexpression and decreased expression of p63 were associated with high tumor grade (p = 0.0002, p = 0.0002 and p = 0.046, respectively) and advanced TNM stage (p = 0.017, p = 0.012 and p = 0.001, respectively) of urothelial bladder carcinoma. In univariate analysis HER2 overexpression was significantly associated with decreased expression of p63 (p = 0.037). In multivariate analysis, only tumor grade was correlated with HER2 overexpression (p = 0.006). In this study, HER2 is overexpressed in 9.3% of urothelial bladder carcinomas. HER2 overexpression was strongly correlated with tumor grade but not with TNM stage, p53 and p63. The development of target therapies using anti-HER2 and the identification of patients which who benefit from those therapies need further studies. Background: Nevus depigmentosus is a congenital, non-progressive, hypopigmented macule or patch that is stable in its relative size and distribution throughout life. The lesions are often single but may be multiple, circumscribed and either isolated, dermatomal or in whorls. The lesions are uniformly hypomelanoic but not amelanotic. The aetiopathogenesis of nevus depigmentosus is not yet fully understood. A defect in the transfer of melanosomes from melanocytes to keratinocytes has been reported. Objective: This work aimed at evaluation of the clinical and ultrastructural characteristics of nevus depigmentosus in a trial to understand its pathogenesis. 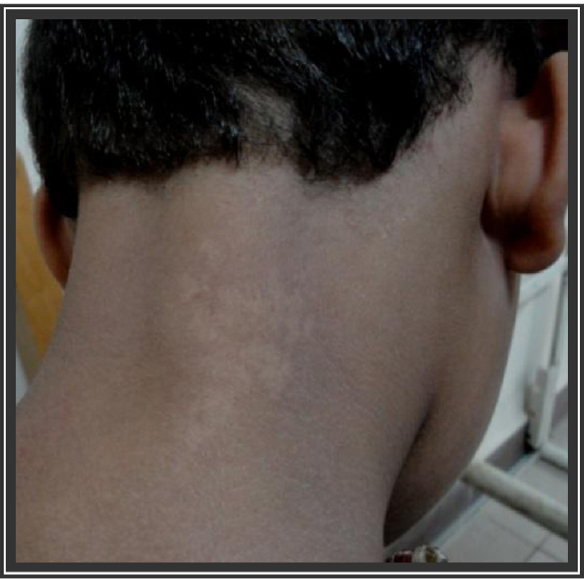 Patients and methods: This study included 15 patients having nevus depigmentosus. 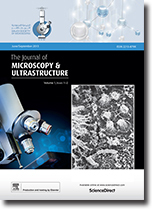 Ultrastructural study was performed for 5 patients. 2 punch biopsies were taken from each patient, one from the center of the lesion and another from the nearby apparently normal skin as a control. Results: The lesions were mostly present before 3 years of age, mostly on the trunk. Six patients (40%) had the isolated type and 9 (60%) had the segmental type. Under Wood's lamp, the lesions exhibited an off-white accentuation without fluorescence. Ultrastructural study showed apparent reduction in melanosomal content of lesional melanocytes and keratinocytes. Immature and aggregated melanosomes were more present in lesional keratinocytes. Electron microscopic DOPA oxidase reaction was decreased in lesional skin compared to control indicating a reduced tyrosinase activity. Conclusion: The results of this study support the hypothesis that nevus depigmentosus is caused by functional defect of melanocytes and morphologic abnormalities of melanosomes. Polycystic ovary (PCO) is a highly variable condition with a wide array of presentations. The polycystic ovary syndrome should meet at least two of the following three criteria: oligo-or anovulation; clinical and/or biochemical signs of hyperandrogenism; polycystic ovaries on ultrasound. The prevalence of PCO is largely unknown in Saudi Arabia. This study presents the prevalence of PCO in young unmarried female students of Taibah University Almadinah Almunawwarah, presenting with menstrual irregularities. The agreed ultrasound features of PCO i.e. 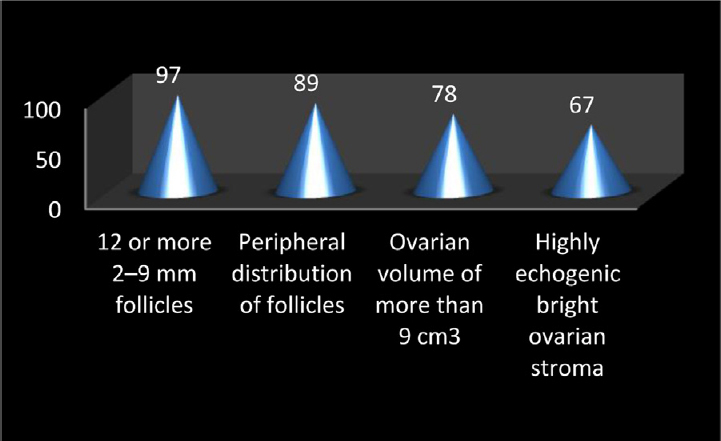 presence of 12 or more 2–9 mm ovarian follicles; a peripheral distribution of ovarian follicles; an ovarian volume of more than 10 cm3 and a highly echogenic ovarian stroma were analyzed in all 108 patients. The criteria of 12 or more 2–9 mm ovarian follicles were found to have highest sensitivity in establishing the diagnosis of PCO. Aim: The aim of this study was to evaluate the diagnostic accuracy of soluble triggering receptor expressed on myeloid cells-1 (sTREM-1) in comparison to procalcitonin (PCT) and C-reactive protein (CRP) in early diagnosis of septic meningitis and its usefulness to distinguish between septic and aseptic meningitis. Patients and methods: This study included 26 patients with septic meningitis, 32 patients with aseptic meningitis and 15 controls. Besides Gram staining, cultures of blood and CSF and latex agglutination test of CSF, CRP, serum PCT and sTREM-1 measurement were done on admission and after 48–72 h of treatment. 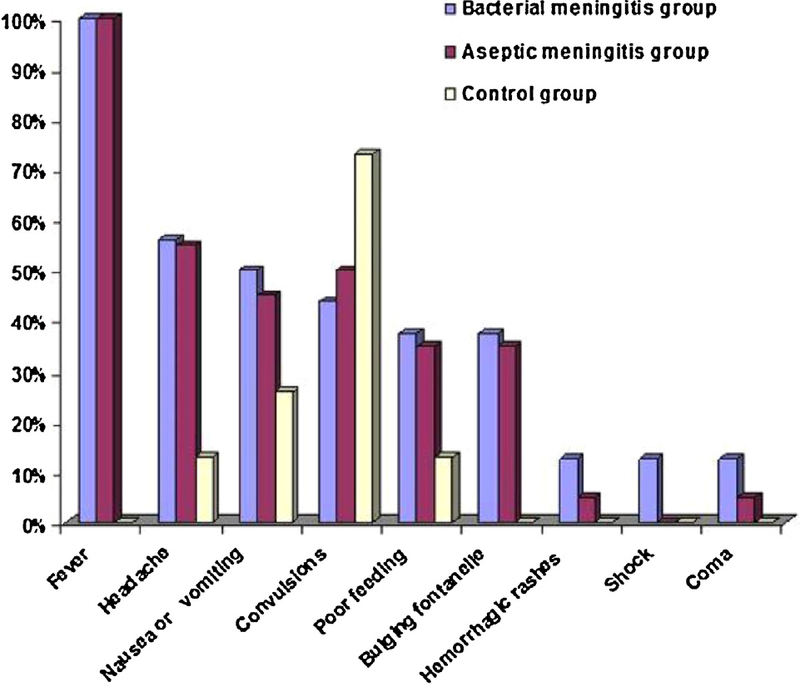 Results: Septic meningitis was diagnosed in 26 (44.82%) of the studied cases. Patients with septic meningitis had a significant increase in serum sTREM-1 and PCT levels at the time of admission (mean 32.99 ± 19.7 ng/ml and 97.9 ± 86.35 ng/ml, respectively), while patients with aseptic meningitis showed (6.8 ± 5.67 ng/ml and 1.88 ± 1.6 ng/ml, respectively). Control group showed sTREM-1 and PCT levels (6.6 ± 4.6 ng/ml and 0.58 ± 0.36 ng/ml, respectively) (P < 0.05). sTREM-1 demonstrated significantly higher sensitivity (93.7%) and specificity (94.3%) in the early prediction of sepsis with an area under the receiver operator characteristic (ROC) curve (95% CI) of 0.94 (0.84–0.99) at a cut off value of 12.4 ng/ml. Moreover, sTREM-1 but not PCT or CRP concentration was significantly lower (P < 0.001) at admission in patients with poor outcome than in those with good prognosis. Conclusions: Both serum PCT and sTREM-1 are valuable in the early distinguishing of septic from aseptic meningitis in children but with markedly higher diagnostic discriminatory power for sTREM-1. Moreover, sTREM-1 has a significant value in determining the prognosis of cases with septic meningitis. The woolly oak aphid (WOA), Stegophylla brevirostris Quednau, is a recently described oak pest in Florida, USA. 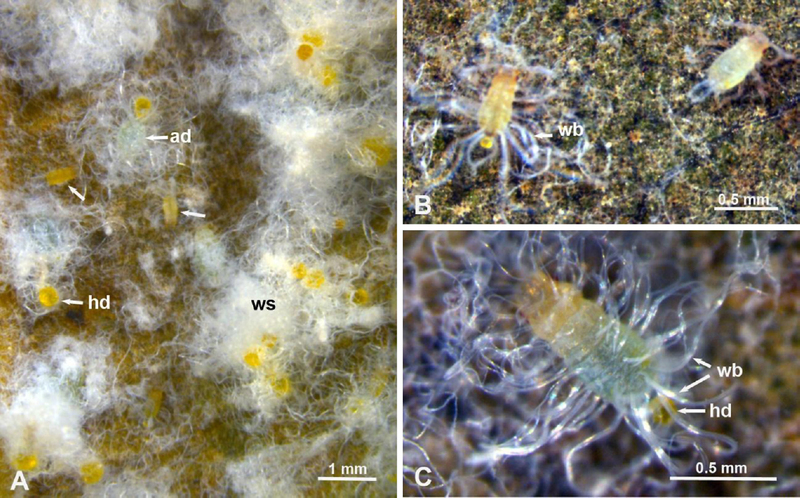 Colonies of WOA on live-oak trees are distinguished by a thick layer of white filamentous waxy material covering most individuals. Nymphs and apterous adults have several long waxy threads/bundles extending from their head, thorax and especially from their abdomen. We used scanning electron microscopy of ‘naturally waxed’ and ‘dewaxed’ aphids to study the ultrastructure and distribution of wax-producing structures on the cuticle. Two types of ‘wax pores’ and smaller wax ‘pits’ were found clustered in wax pore plates around dorsal setae on the head, thorax and abdomen. The larger, type-1, wax pores produce short or long wax columns with honeycomb interior; the smaller, type-2, wax pores produce short or long hollow wax tubes; whereas wax pits produce the shorter and more loosely net tufts of wax filaments covering most of the body dorsally. Wax columns or tubes produced by clusters of types-1 and 2 wax pores aggregate together forming the longer and thicker wax bundles that extend dorsally and laterally from the cuticle, especially near the posterior end of the abdomen. Type-2 wax pores and wax pits were also found on parts of the legs and antennae. Infrared spectroscopy indicated that wax esters, containing saturated fatty acids and fatty alcohols, are the major constituents of WOA waxy secretions. The possible roles of these secretions, especially in avoiding contamination with honeydew and providing some protection against natural enemies and adverse climatic conditions, are discussed. Objectives: The aim of this study was to compare, by scanning electron microscopy analysis, the cleaning efficacy of a 2.5% sodium hypochlorite (NaOCl) and a 17% ethylenediaminetetra-acetic acid (EDTA) solution with the two solutions either applied alternately or mixed together for smear layer removal after the use of each endodontic file in different root thirds. Materials and methods: Fifty-four single-rooted human maxillary premolars were used and divided into three groups. Manual instrumentation was performed with K-Flexofiles with the crown-down technique; and divided in Group 1: canal preparation was performed with 2.5% NaOCl mixed with 17% EDTA in the root canal. Group 2: irrigation was performed alternately with 2.5% NaOCl and 17% EDTA. Group 3: only 2.5% NaOCl was used during all instrumentation and EDTA for 3 min at the final. The mean scores for the smear layer by SEM after the use of each file were calculated and analysed. Results: A statistically significant difference (P < 0.05) was found among the instrumentation groups between the apical third and the middle and coronal thirds. In the apical third, the canal walls were often contaminated by inorganic debris and smear layer. Conclusions: The alternate or mixed use of EDTA during instrumentation with 2.5% sodium hypochlorite was the most effective form of irrigation for the removal of smear layer on the cervical and middle thirds. No form of irrigation was sufficiently effective to remove the smear layer in the apical third. Clinical relevance: The importance of the alternating use of 17% EDTA and 2.5% sodium hypochlorite during root canal instrumentation. A hydroponic experiment was carried out to localize lead accumulation in tobacco roots and leaves. Plants were grown for seven days in Hoagland's solution supplemented with different concentrations of lead nitrate [Pb(NO3)2]: 0.0 (control), 10 μM, 100 μM, and 500 μM. 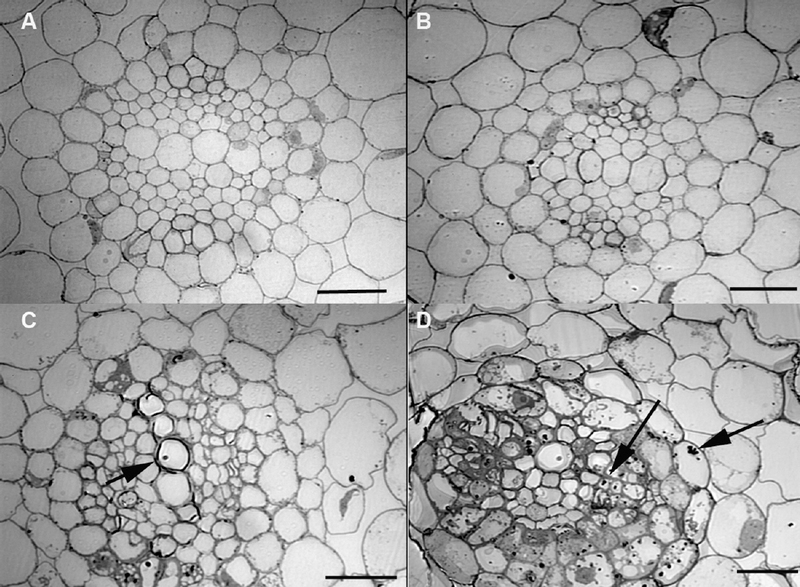 Growth was inhibited in plants treated with 100 μM, and 500 μM. Light and electron microscopic studies showed that lead accumulated mainly in cell walls and vascular tissues of roots of plants exposed to 100 μM, and 500 μM lead nitrate. In contrast, roots exposed to 10 μM lead nitrate did not show any detectable accumulation of lead in the roots. The TEM images confirmed the presence of lead outside the epidermis of the roots in the form of electron dense clusters of fine needles. No lead was detected in the leaves. However, plants exposed to 100 μM lead nitrate were characterized by the presence of ferritin clusters in the chloroplasts. This suggests a protective mechanism by the plant to prevent oxidative damage caused by Pb. Plants exposed to 500 μM lead nitrate showed mesophyll cells containing altered chloroplasts with disrupted thylakoid systems.